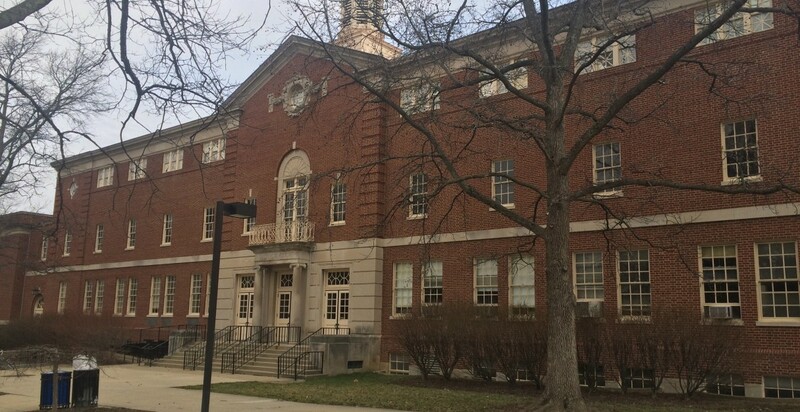 Withrow hall is a new residence for 280 upper classman students consisting of traditional single, double, and triple rooms with community baths. Other residential amenities include central floor lounges and a variety of study spaces. A first floor community lounge with fireplace, kitchen and rec area is the heart of the building. The new hall also features a full-service Starbucks with indoor and outdoor seating adjacent to McKie Field. Designed to respect the signature Georgian vernacular of the campus, its careful proportions create a timeless vista on approach. The new hall is located on the former site of Withrow Court. Built in 1931 and named after Miami student & trustee of 46 years, John Withrow, it was Miami’s first gymnasium, and the building held many memories for alumni. Appreciating the sensitivity to the demolition of Withrow Court, the design team carefully massed the new building to reflect a similarly proportioned elevation on Tallawanda Road, and salvaged and repurposed the stone entry columns and entablature, fan panel, and its signature round window with intricate stone carvings. In addition, the cupola and stone base were replicated with similar proportions and details. 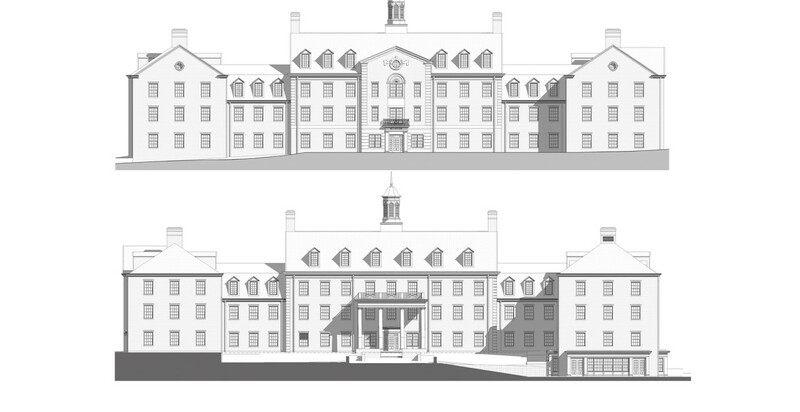 Withrow Hall, along with Presidents Hall, are two new buildings designed by Mackey Mitchell in the North Quad. In addition, MMA lead the design renovation of Martin Dining and the renovation of Flower, Brandon, and Hepburn Hall, and the renovation and new addition on Hahne Hall. MMA is proud to be part of the exceptional design team charged with the residential transformation of the North Quad area of campus. We are honored to have worked continuously with Miami University since 2012 with the design of the Western Campus residence halls: Stonebridge, Beechwoods, and Hillcrest. 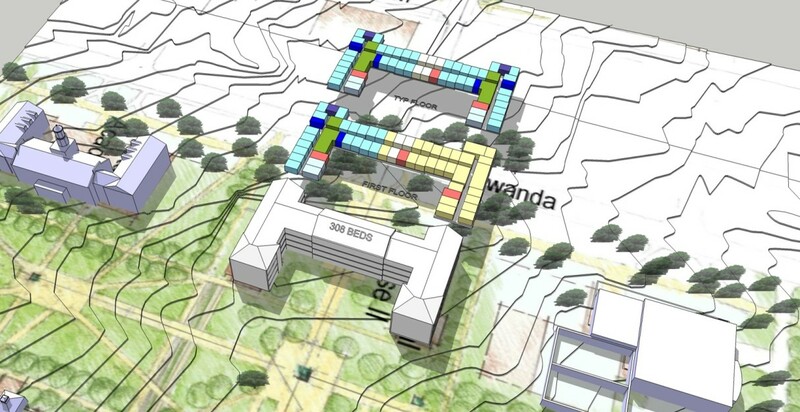 Numerous massing studies were reviewed during programming to determine the appropriate amount of beds for the site. 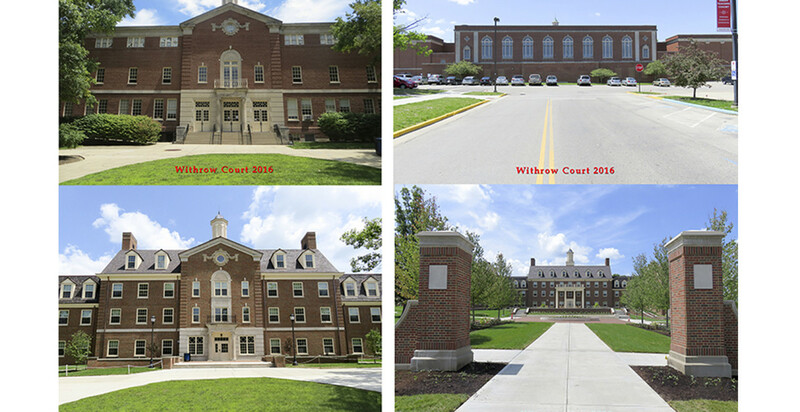 Before and After Pictures of the new Withrow Hall and Withrow Court showcasing the transformation on site. Withrow Court elevational view from Tallawanda. Many of the proportions were studied and significant stone elements were salvaged and integrated into the new building. Detailed elevations were created to study proportions and scale. People are really starting to buzz about the new Withrow Hall and surroundings. The project is nothing short of stunning!